I found out I was pregnant the morning of August 30, 2012. My husband and I were thrilled to be having our first child. A rush of emotions surged through me over the next few days: shock, excitement, happiness, joy, wonderment. I was on a natural high. The baby was due on April 30, 2013. My pregnancy progressed as it should through the end of 2012 and as the New Year dawned on 2013. He or she was growing on schedule and did its most active kicking at night. Once I was settled and comfortable in bed, the baby would start dancing across my belly. The night of Wednesday January 23, 2013, I felt no such movements. I wasn’t concerned until I woke up the next morning and still did not feel any movements. Something wasn’t right. I went to the doctor’s office to listen to the heartbeat—it was there, but so were contractions. I did not feel those contractions at all, but they were causing my baby’s heart rate to drop. The doctor ordered an ultrasound to check my amniotic fluid level. Some good news: at least that was normal. After the ultrasound, I was in a room waiting for the doctor to do a vaginal exam. The first words out of her mouth were, "Oh my God! This is bad," and then she mumbled something about a cesarean section. She told me my cervix was bulging and I was two to three centimeters dilated. At that moment, my heart shattered into a million pieces. All I could think to say was, "I just want him to live." I had read that babies can survive out of the womb at 26 weeks, but somehow, that didn’t seem quite so comforting when faced with this head-on. I was crying. I was hysterical. I was shaking. I was in shock. What did this mean? Would my baby survive? My entire life was just flipped upside down. I called my husband and my parents to come to the hospital. In the meantime, I was taken to Labor and Delivery. The plan was strict bed rest and administration of medications in order to lighten my contractions. I was inverted in bed for 36 hours. I had so many thoughts to process. I had a hard time giving up the life I was used to. I had to come to terms that this was happening—that being in the hospital was the best thing for my son. By Saturday, two days later, we finally saw improvement. The nurse checked my cervix, and it was thicker and higher up. I was able to get off of the magnesium, which was causing hallucinations. My bed was able to be flat, rather than inverted. I was unhooked from all monitors and lines, so while I was still on bed rest, I was able to walk to the bathroom. I could wear my own clothes, and I could eat anything I wanted! My water broke the next afternoon around 3 p.m. Half an hour later, I started having back contractions, which then moved to the front of my belly. With my amniotic fluid level now significantly lower, the contractions put more stress on Samuel. He was able to tolerate the contractions for only a few hours, and then the doctor said, "It’s time to get that baby out." I delivered Samuel by cesarean section at 6:35 p.m. that Sunday, January 27, 2013. He weighed 2 pounds, 9 ounces and measured 13.5 inches. I was not conscious during my son’s birth—the spinal block did not work, so they had to put me under. In the meantime, Samuel was rushed to the NICU, my husband only able to catch a glimpse of him. I did not actually meet Samuel until the following afternoon. On the way to the NICU, I was so excited and nervous. My heart was racing. I was giddy and felt a huge smile on my face. And then, the moment I laid eyes on Samuel, I fell in love with him. My heart grew a hundred times. I loved everything about him: his dark hair, his hands and feet, the fuzzy hair on his body. He looked just like me, too. Our son had arrived! We had a baby! It hurt me to see my son in an incubator, attached to so many tubes and wires. I hated my body for kicking him out so early. We later learned that my going into premature labor was caused by an intrauterine infection; the placenta, the umbilical cord, the amniotic fluid, and even Samuel himself were all full of infection. But Tuesday night, two days after his birth, was magical. That was the first time Samuel and I "kangarooed." I took my shirt off, and the nurse placed him on my chest and wrapped us in warm blankets. That was the first time I felt like a mommy. You know how you go through your whole life searching—for meaning, for purpose, for direction, for guidance, for answers? My entire life made sense to me when I held Samuel for the first time. Everything just fell perfectly into place. The puzzle was complete. Samuel was the missing piece. Samuel completed me. He completed me and my husband, John. My life continued to make sense every time he was in my arms. The chemistry between us when we were skin to skin was electrifying. I could feel the love flow between us and through my veins. The next day, I was discharged from the hospital. It was so hard to leave Samuel. I was in tears as we drove away. My husband works a lot— up to 12-14 hours a day. He works hard to provide for his family and to allow me to be a stay-at-home mom. He was only able to visit Samuel once or twice per week. But Samuel and John had a strong connection even while Samuel was in my womb. That bond continued, separated only by the glass of the incubator. Samuel always looked his daddy in the eyes when he heard his voice, a gesture of love between a father and his son. I visited Samuel every single day during his assessment times. There was so much medical jargon to try to understand. John was better than I was at processing and understanding it all; my primary focus was simply caring for Samuel and giving him my unconditional love. As humans, we are creatures of habit. We like routine; at least, I do. I developed a routine with Samuel. During the days, I was home pumping every three hours, and he received my breast milk through a feeding tube. I spent most of my days preparing the house for his arrival, and I was preparing myself mentally, as well. But every day, when 5 p.m. rolled around and I was at the hospital with my son, nothing else mattered. The outside world faded away, and it seemed like Samuel and I were the only two people on this earth. "Hi, Samuel. Mommy’s here. I love you!" This is how I greeted my son every day. The nurse would come over and give me an update as to how he was doing; then I would begin his care. I started by taking his temperature. Sometimes, he would fuss because I had to lift his arm up. He’d make a squishy face and stick his tongue out. I couldn’t hear him cry, though, because the ventilator tube went through his vocal chords. Next, I changed his diaper. (I loved changing Samuel’s diaper.) I would go wash my hands and come back to do eye and mouth care. I used saline wipes for his eyes and nursery water and a swab for his mouth. I put Aquaphor on his lips so that they wouldn’t dry out. Then we would kangaroo for one hour during his feeding. As the days went by, that hour stretched a little longer. I loved holding Samuel, and I loved taking naps with my son. When Samuel was in my arms, I sang to him, I told him about my day, I read to him. He was the best part of my day. He made me so happy. He took me outside of myself. I was there for three hours each night. 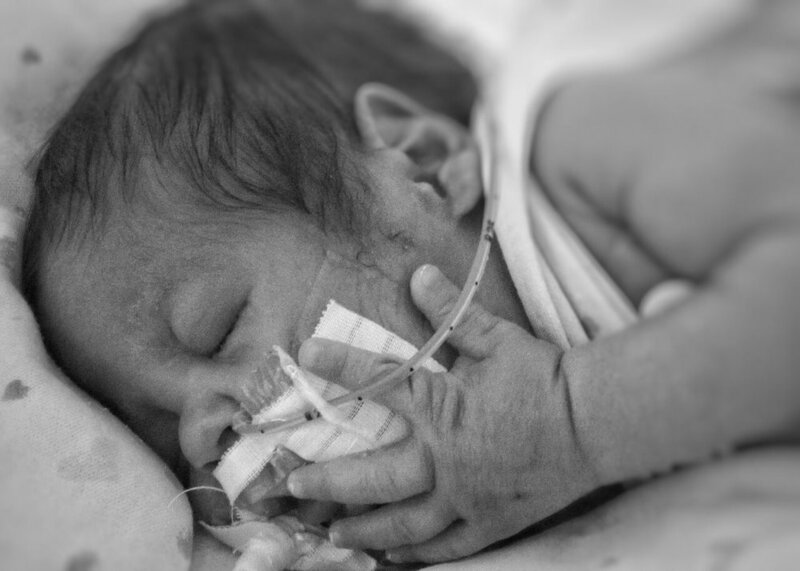 It was so hard to say goodbye—to leave him in the NICU and to go home without him. "Goodnight Samuel. Sweet dreams. I love you, my son. I love you, sweet boy. I love you! I love you! I love you!" Samuel developed a left inguinal hernia, meaning his intestines descended into his scrotum. He would need surgery to correct this before he could come home. He had a yeast infection, but that went away with the application of topical ointment. He had several eye exams showing he had abnormal growth of blood vessels in the retina; this was being monitored weekly. But towards the end of March, almost two months after his birth, Samuel was showing signs of improvement. His nurses were able to gradually wean his oxygen rate down. It was looking hopeful that we could get him off his ventilator soon. Then on March 31, Samuel developed a fever of 103°—the pneumonia had returned. His blood was also infected with Staphylococcus aureus and Enterococcus feacalis. Looking back, this was probably Samuel’s threshold. This was all that his little, underdeveloped body could handle. On March 25 and again on March 30, Samuel coded. His heart rate and oxygen levels dropped significantly, but they were able to bring him back from the brink. Another time when I was holding him, he froze in my arms. I thought I had lost him then. But he came back to me. Weeks went by without incident. On Saturday, April 13, I was preparing for another routine day visiting my son. At 5:30 p.m., after tending to his needs, I was skin to skin with Samuel. His nurse and I were talking about creating a plan with his doctors to get him home sooner. She took a couple pictures of Samuel, and then she let us be together. At 6 p.m., my sister-in-law came for a visit. While conversing with her, my attention was on Samuel. I was feeling the joy of holding him and being his mommy. I envisioned our future together. He did so well while I was holding him; the nurse didn’t have to come in at all to adjust his oxygen levels. At 7 p.m., shortly after my sister-in-law left, I decided to put Samuel back in his crib. I was going to read or sing to him once he was settled. His nurse picked him up from my chest and placed him back in his crib. While she was hooking Samuel back up, I put my shoes on and fixed my shirt. I noticed he was crying and upset, so I walked around to the other side of the crib to comfort him. I put my hand on his head and said, "Don’t cry, Samuel." Then he froze and stopped breathing. More and more nurses surrounded him. I moved out of the way. I wasn’t even worried, since he had done this before—I thought they would bring him back. I felt like an observer, like I was watching E.R. or Grey’s Anatomy. The doctor came in. He looked nervous, frantic even. He took out Samuel’s ventilator tube and put a new one in. He wanted me to leave the room, but I flatly refused. I needed to be there, both for Samuel and for my own peace of mind. I couldn’t see anything, though; too many people were blocking the sight of my son. I still wasn’t worried. They would bring him back. At this point, they kicked me all the way out of the room. I didn’t know what was going on or what to make of the situation. The doctor came out twice and told me each time that this wasn’t good, that he didn’t think Samuel was going to make it. I couldn’t even process what that meant, but I told him to keep trying. It took forty minutes to get Samuel “stable” and a heart rate established. When I was able to see my son, his body was lifeless. He looked fake. I knew to check his eyes. They were frozen in place and glazed over—the look of death. I burst out crying. I tried calling him back to me while I shook his little hand. "Samuel . . . Samuel . . ."
I knew my son wasn’t there anymore; they were just keeping his body alive. I stepped out to call John and my parents. When I came back, he was on a different machine, an oscillator. It was shaking his little body constantly to oxygenate his blood, and it was doing 100% of the breathing for him. His nurse was listening to his heart with her stethoscope; I asked if I could listen, too. I heard a very faint heartbeat being drained out by the noise of the oscillator. That was my glimmer of hope. His heart was still beating. Samuel stayed on that machine all night and into the following morning. Then, his heart rate started to drop. An X-ray showed he had an enlarged heart and that his intestines were getting bigger. Samuel’s stomach was expanding before our eyes. His nurses prepared us for what could happen, and we had Samuel baptized by the hospital chaplain. My husband, myself, and my mom sat by Samuel’s bedside. I started reading to him just so he could hear my voice. My husband continued to hold his hand. At 8:27 a.m., Samuel’s heart rate dropped below 80 beats per minute (BPM). I looked at the monitor. 75 BPM. We moved to make way for the team. 50 BPM. They started compressions and Epinephrine, but his heart rate continued to drop. 30 BPM. Less than 20 BPM. Down to zero in six minutes. At 8:33 a.m., Samuel’s heart stopped. I listened with the stethoscope but heard nothing, just an empty body cavity. We had them continue with CPR while the chaplain said a prayer. When the chaplain finished, the doctors said there was nothing else they could do. I listened again for his heartbeat, but there was nothing. I looked up at my husband and saw his tears. We gave them the okay to stop. At 8:53 a.m., Samuel was pronounced dead. I picked up my son and hugged and kissed him. The nurses disconnected his wires and tubes and handed him to me. That was the first time that I saw my son’s face without tape and tubes. It was the first time I held my son like a mother holds her baby. You may be wondering what to do and where to go from here. I am three and a half years out from my loss and still have not fully processed my son’s death. Honestly, I have no idea when, or if, I ever will. My mind only allows me to think about what happened with Samuel for a few minutes at a time, and at random moments. Grief does that. Grief is confusing. Grief takes a lot of time and effort to understand and process. Grief has many layers—it is draining and exhausting. I hurt. I ache. I feel like my soul is missing. But because my love for Samuel goes so deep into my soul, the grief is just as deep. Grief hurts, but it is also an expression of how much I love my son. Each and every one of us travels the road of grief differently. There is no one "right way" or "wrong way" to grieve. Simply put, there is only what is best for you. Be gentle toward yourself. When you feel a wave of grief wash over you, ride the wave—don’t fight it. Allow yourself to experience those emotions. Only in doing so can they be released. I have kept a journal my whole life, so it was only natural that communicating my grief in words was an outlet for me. After Samuel died, he gifted me with a passion for photography; I would go out on photo shoots and take pictures and enter contests. In this way, Samuel opened my eyes to the beauty that surrounds me. It was our way of spending time together. I learned that in order to "keep on keeping on," I have to find things that motivate me and distract me—so that I can live and grieve simultaneously. Life is all about balance. Going through a traumatic loss can make you feel like you are the only person on the planet who has ever lost their child. You are not alone. It’s a difficult step to take, but I encourage you to reach out to a local organization that specializes in pregnancy and infant loss, such as Share, where you can meet and talk with people who are going through the same loss. I continue to honor and cherish Samuel’s memory. I want the world to know that Samuel lived and that his life is still important, no matter how short, and no matter that only his family knew and loved him. Samuel is very much a part of our family and always will be. When we sign cards from our family for birthdays and holidays, we include Samuel’s name. I also attend memorial events hosted by local support groups. Shortly after Samuel died, I couldn’t bear not having my baby in my arms any longer. I needed to feel that intense love between a mother and her child again. Samuel sent me two rainbow babies. It took a full year after they were born for my heart to open again. Now that it has, I love them just as much as their brother. In this way, taking care of and being a mother to Samuel’s siblings is also taking care of him. Thank you for honoring my son’s memory by reading our story. I encourage you to share your own and to lean on this community. You are not alone.